I’ve been asking one question since Andrew Olivier released his recordings of two top Liberals offering him jobs to step aside in the 2015 Sudbury by-election. Why isn’t Kathleen Wynne facing charges? It’s not just that I think Wynne, who runs to the left of the NDP, would look good in an orange jumpsuit – orange is the new black in case you haven’t heard – but also because we have recordings of two people saying they want to offer a politician a job, on Wynne’s behalf, not to run. Ladies and gentlemen, that to me sounds like bribery. 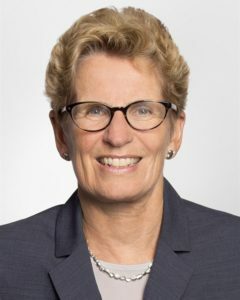 Wynne may not be facing charges but today, two top Liberals will be in court to answer charges of offering a bribe to a candidate to step aside for the preferred candidate of the premier. This all goes back to the Ontario general election of 2014. Andrew Olivier was the Liberal candidate in that election. Olivier, a mortgage specialist turned politician lost in that election to the NDP’s Joe Cimino. The area had long been Liberal both provincially and federally but the NDP had made inroads and stolen the seat at both levels. Suddenly Cimino, just five months into the job, announced that he was stepping down due to health reasons. Olivier, who lost by less than 1,000 votes, starts ramping up his campaign to take the seat back for the Liberals. Glenn Thibeault, who held the seat federally for the NDP, approached Kathleen Wynne and said he would cross not only the floor from the NDP to the Liberals but from federal to provincial politics is he could be the candidate. That left Wynne trying to figure out how to dispose of Olivier. Now I will admit, this is not the first time that a candidate has been promised a job or appointment to step aside and it won’t be the last. And nor are the Liberals the only party to do this. But the difference here is we have proof and the reason we have proof is that Andrew Olivier is a quadriplegic who records his conversations and phone calls as a way to take notes. It is something that anyone who had dealt with him, such as the two top Liberals on trial would have known. And yet there are still recordings of them offering Olivier jobs and appointments if he will only step aside for Glenn Thibeault. “I come on behalf of the premier,” Gerry Lougheed said while visiting Olivier on December 11, 2014. Lougheed is a local businessman and chair of the Sudbury police services board at the time. More importantly, he is a local Liberal boss that makes things happen. During his visit Lougheed asked Olivier to step aside for Thibeault and nominate the NDP MP turned provincial Liberal candidate. “In the course of that deliberation, the premier wants to talk to you. They would like to present you with options in terms of appointments, jobs, whatever that you her and Pat Sorbara can talk about,” Lougheed said. Later that day Wynne called to speak to Olivier directly. Remarkably there is no recording of that call so we don’t know what was said but Olivier maintains that Wynne never made a direct offer to him. The next day, December 12, 2014, Pat Sorbara, who was then Wynne’s deputy chief of staff, called Olivier and leaned on him heavy to step aside for Thibeault rather than forcing the premier to appoint him. When Olivier didn’t budge, saying he wanted to run as the Liberal candidate, Sorbara offered him a job to step aside. One of the premier’s most trusted confidantes, one of her top staffers, said that Olivier should decide what he would be most interested in doing and how they could make that happen. “Whether it’s a full-time or part-time job in a constit[uency] office. Whether it is appointments to boards or commissions. Whether it is, also going on the executive,” Sorbara said. One of the premier’s top aides had just laid out the menu of possibilities for Olivier, tell us what job you want to step aside and it is yours was the message. He chose the option that Wynne, Sorbara and Lougheed wished he hadn’t, none of the above. Not only that, three days later on December 15, 2014, Olivier went public with his claim that he was offered a bribe. He didn’t release the recordings of his conversations but he did say what he was offered. Quickly, and without asking to listen to the recordings that they knew existed, the Ontario Provincial Police decided to protect Wynne and her associates by announcing on January 12, 2015 that the Liberals had not committed any criminal offence. It wasn’t lost on many observers that the OPP union had effectively campaigned for Wynne and the Liberals in the previous election. Three days after the OPP closed the case, Olivier posted the recordings of his conversations to YouTube. You can listen to both, in their entirety below. The release of these recordings forced the OPP to do their damned jobs and not be a political police force for Wynne and the Liberals. On February 19, 2015 – just two weeks after Thibeault wins the by-election – Elections Ontario finds that the actions of Sorbara and Lougheed violated the Election Act. It still takes until late September of that year for charges to be laid but remarkably only against Lougheed. This is ten months after the offer was made and 9 months after it was made public. No charges are laid against Sorbara at this time. Nothing happens for months and then in April 2016, Lougheed’s charges under the criminal code are stayed. It looks like the Liberals will walk away unscathed despite clear evidence. Then in October 2016, almost two years after the fact, charges are laid against Lougheed and Sorbara under the Election Act rather than the criminal code. Sorbara faces two bribery charges, Lougheed one. Wynne is not charged but agrees to testify, as does Thibeault. So the trial is set to begin, the premier will testify next week onSeptember 13, 2017 – or 1007 days – after she sent her emissaries to offer a job, an appointment or whatever else it would take to get a candidate to step aside. If these two can’t be convicted of bribery with the clear evidence the court will hear then we should just take the charge off the books. Let’s hope the right thing happens.